Car cruise controls that use radar to maintain pace with the car in front! Cruise control systems have been available in cars for many years. However, a new type of cruise control is now being fitted. It’s called Adaptive Cruise Control and it uses radar to maintain a safe distance to the car in front, even if that car’s speed changes. On the road it’s a brilliant innovation that improves safety, reduces fatigue and adds convenience. But how does it work? The last decade has seen the widespread introduction of systems than enhance car intelligence. Anti-Lock Braking (ABS) and Electronic Stability Control (ESP) give the car the ability to act in ways not specifically requested by the driver – for example, to release the brakes momentarily to prevent wheel lock-up or to reduce throttle opening if the car is sliding. Adaptive Cruise Control is another step on that road to enhanced intelligence. However, not present is the most critical of inputs – a forward-looking sensor. An Adaptive Cruise Control forward-looking sensor must meet certain strict design requirements. The sensor must be able to rapidly detect that the car ahead is being closed upon. If the sensor is slow to react, a greater range will be required of it otherwise the following car will draw too close before throttle reduction or braking occurs. The magnitude of permitted braking will also affect this requirement: if the car is permitted to brake hard then the sensor can be slower to react. Assuming a maximum automatic braking deceleration of 0.2g, a maximum closing rate of 50-65 km/h and a minimum following distance of 20-30m, a sensor range of 80-100 metres is again a minimum requirement. The field of view (FOV) of the sensor can be defined both in terms of azimuth (left/right) and elevation (up/down) angles. The azimuth FOV is important if the system is going to be effective at working on curves. 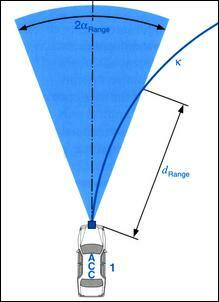 As this diagram shows, beam width has a major affect on the distance at which a cornering car can be tracked. At a speed of 90 km/h the ACC following distance will be about 50 metres. Assuming a minium radius-of-curvature of 300 metres, a minimum sensor FOV of 5 degrees is required. However, addition FOV is usually needed to take into account mechanical or electrical misalignment of the antenna – a point that we‘ll come back to. In addition to these three requirements, the sensor must be able to withstand a temperature range of -40 - +80 degrees C, be proof against water splashes and pressurised steam, be immune to vehicle vibrations, resist stone impacts and be as small as possible. 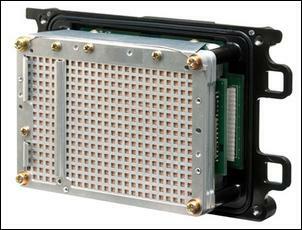 Two types of forward-looking sensor have been developed – lidar and radar. However, the radar-based sensor is most widely used and it is this type of sensor that will be covered here. Two types of radar sensors are used – those with stationary antennas and those that mechanically sweep back and forth. US automotive components manufacturer Delphi has developed a scanning sensor with a narrow 2-degree beamwidth. This beam is mechanically swept over a 15-degree detection region and has an elevation FOV of 4 degrees. As the antenna is scanned, over 40 individual transmit/receive beams are executed with each pass. However, much more common is a sensor that has a fixed antenna. 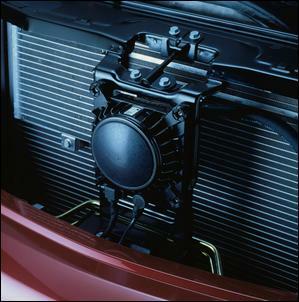 The Bosch system (used by DaimlerChrsyler, BMW and Audi) uses this approach. The Bosch system uses a Frequency Modulated Continuous Wave (FMCW) output. Instead of timing the period between transmission of the signal and the echo, a FMCW radar system compares the frequencies of the transmitted signal and its echo. The output frequency is changed at a rate of 200MHz per millisecond and so the time interval between the transmit and receive signals can be established by determining their frequency difference. However, because the distance between the transmitter and its target may be changing, this differential frequency information contains not only the time interval component but also the frequency shift (ie Doppler component) indicative of the change in distance. This ambiguity can be resolved by the use of multiple FMCW cycles using differing rates of frequency change. By these techniques the distance to the target and whether the target is drawing closer or moving further away can be established. However, more data is also needed – is the target directly ahead or to one side of the forward aim? If the target’s radar reflective characteristics are known, the amplitude of the signal echo depends on the angle at which the signal is received by the radar. However, when the reflective characteristics of the target are unknown, a different approach needs to be taken. To determine the angle at which the radar detects an object, three radar lobes are transmitted and analysed. The ratio of signal amplitudes of the three different lobes provides this angular information. The Denso radar used in Toyota/Lexus models uses a more conventional type of radar. Distance is detected by measuring the time between transmission and reception, while relative speed is detected by the frequency shift (Doppler Effect) of the reflected waves. The angular position is detected by the phase differences of the signals received by multiple antennas. The Denso unit also differs from the Bosch design in that it has separate receiving and transmitting antennas (although all the antennas are mounted in the one assembly). The physical layout of the Bosch radar sensor is shown here. 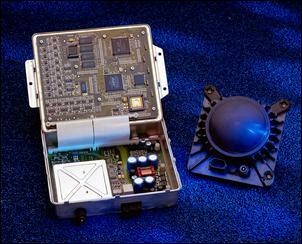 The radar and the ACC controller are integrated into one housing. The front of the unit features a Fresnel lens that is used to focus the three radar lobes. The lens is made from a special temperature- and stone-resistant plastic which is formed as part of the module casing. The lens incorporates a heating element which prevents it becoming coated in snow or ice. According to Bosch, wet snow has a particularly great attenuating effect on the radar signal. In one iteration of the Bosch design the sensor assembly comprises three circuit boards. The first consists of the radar transceiver unit which is mounted directly on a circuit board, keeping interconnections as short as possible and so reducing susceptibility to interference. Also on this board is a digital signal processor, purpose-developed 10- and 12-bit analog to digital converter, SRAM and flash memory. On the second board is a 16-bit microcontroller which performs the necessary car speed control calculations. The third board contains the driver modules to allow connection to the car’s electrical and CAN bus communications systems. The module must be aligned in both vertical and horizontal planes. In the horizontal plane Bosch state that a degree of accuracy of better than 0.3 degrees is required, while BMW put the figure at 1 degree and Cadillac at 2 degrees. The BMW system requires the use of a BMW service tool to perform the alignment, while Cadillac systems can be placed in an ‘alignment mode’ and then automatically aligned by being driven along with a road that has stationary objects either side. Apparently, the more stationary objects (such as light poles, mail boxes, etc) there are, the quicker the self-alignment occurs! It is all very well to detect the presence of cars in front, but how is it determined whether the car is in your lane or another? What about when cornering? And what happens when a car cuts into your lane? This diagram shows the signal processing architecture of a typical ACC. Once the objects are detected, tracking of them occurs. Both their paths and also the path of the controlled vehicle are estimated, the input commands of the driver are noted and the ACC controls the throttle and/or brakes. In the Bosch FMCW system, positive detection of objects is carried out by comparing consecutive radar modulation cycles. If in the second cycle the object is found where on the basis of its previously detected speed and position it could be expected to be placed, it is assumed to be the same vehicle. In other words, the object data is filtered on the basis of historical information. Additional object tracking functions are carried out where there are multiple simultaneous echoes from different distances, which can be the case with large trucks. In this situation the multiple echoes are combined so that the system sees only one object. The lateral position of the object versus the predicted course of the ACC system’s own vehicle is calculated. 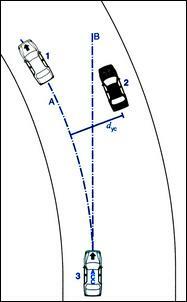 A calculation is made of the object’s "lane probability", that is, which lane the object is most likely to be in. Lane probability is a main input into the next step, that of a "plausibility attribute". Together with the frequency and reliability of object detection, this determines the degree of plausibility that the detected vehicle is in the same lane as the ACC car. The object is selected as the target only if the degree of plausibility is sufficient. This plausibility is based only on moving objects – ACC systems ignore stationary objects when selecting targets. The first step – that of locating the object relative to the predicted course of the ACC car – is most critical. This diagram shows three cars travelling around a curve on a multilane road. Car 3, the car equipped with the ACC, is at the bottom of the diagram. Without an ability to accurately model the predicted course of the ACC car, the system would expect to follow Course B and therefore sense Car 2 as being ahead of it in its lane. However, the ACC car will actually follow Course A and so must sense Car 1 as being ahead of it. Course prediction is based on the "trajectory curvature". That is, the change in direction that the car is undergoing as a function of the distance travelled. This is determined by sensors detecting steering angle, lateral acceleration, yaw and the difference in left/right wheel speeds. The effect of crosswinds, road camber and differences in wheel diameters can all reduce trajectory curvature prediction. Combining the techniques reduces the probability of error. 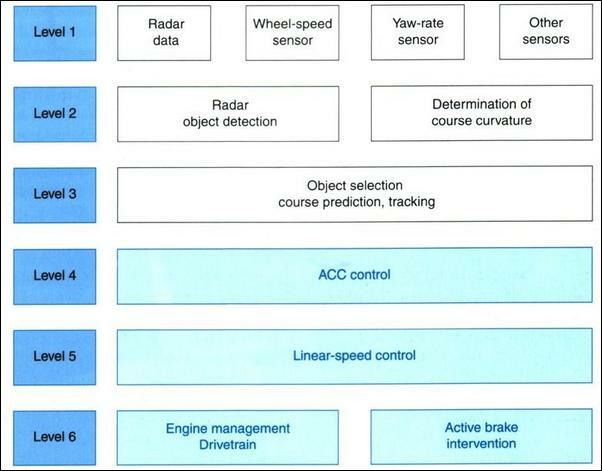 In addition, the ACC system can use the current and past positions of stationary and moving objects to determine the projected course of the car. This can be carried out by analysing the apparent lateral movement of vehicles in front as they enter a bend, and analysing near-road stationary objects. Special logic is used in sharp bends. If it is sensed that the car is negotiating a sharp bend, a reduction is made in the maximum permissible acceleration (note that in this context, acceleration also refers to deceleration) so as to maintain vehicle stability. Secondly, as described above, the effective range of the radar beam is much reduced in corners and so the ACC modifies the allowable acceleration to suit this reduced "visibility". Finally, if the target car disappears from view, logic prevents the ACC vehicle from suddenly speeding up. The Bosch ACC uses the 6-level control sequence shown above. The first level is the input of data from the radar, wheel-speed sensors, yaw sensor and other sensors. The second level is to identify the moving objects ahead of the car and assess their plausibility of being in the same lane. In this step the data from the other car system sensors is assessed to determine the degree of curvature of the road. Once this has been done, the system can calculate the projected trajectory of the ACC car and track and predict the course of other vehicles. A target vehicle is established – normally it will be the one calculated as being ahead of the ACC car in the same lane. However, this is not always the case: if vehicles ahead of the ACC car (or the ACC car itself) change lanes, a group of several possible target vehicles can be considered. The next step is the calculation of the required acceleration. The actuation system by which the car’s speed is to be changed is selected (it can be throttle, brakes or transmission) and then finally, this control is exerted. The driver has control over two functions: the set speed and the distance to be maintained between the ACC car and the car ahead. As mentioned earlier, the distance is set by means of a requested time gap which is generally in the range of 1 – 2 seconds. Most cars equipped with ACC use a similar driver interface. 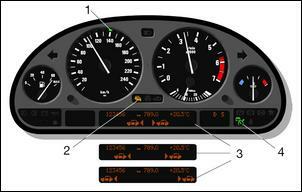 The selected cruise speed is shown by an illuminated segment or LED on the speedometer. The selected gap spacing is shown diagrammatically on a dot matrix or TFT display – for example, by the spacing between two diagrammatic cars. When the ACC is tracking a car, another symbol illuminates on the dashboard display. In this way, the requested and actual vehicle speeds, the requested gap and the tracking action of the ACC can all be quickly and easily seen. 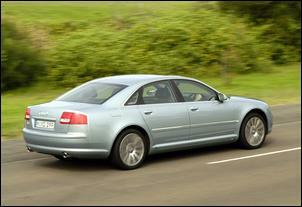 In the past we’ve been able to drive the Audi A8 4.2, a car that features Bosch Adaptive Cruise Control. And what was it like? In a word, brilliant. We didn’t have a chance to test it on tight, winding country roads but in freeway conditions it was superb. Speed selection is available only in 10 km/h increments – which is fine when you no longer need to ‘tap-up’ and ‘tap-down’ in tiny increments, trying to maintain a constant gap to the car in front. As you would expect with a system that maintains a constant time gap, at slow speeds the Audi would creep up on the car in front and at higher speeds it would drop back. All automatically, of course. If the car ahead slowed abruptly, the Audi would automatically apply the brakes – and if it was deemed by the system to be an emergency stop, an audible alarm sounded and you were expected to brake. A green symbol showed on the instrument display when the car in front was within the minimum safe distance – this changed to red when driver braking was needed. But describing the system in step by step detail makes it sound more cumbersome than it really was. This is literally a set-and-forget system – on a drive from Sydney to Canberra or Melbourne, it would be simply awesome.